Dockyard workers putting up the sheerlegs at Il-Maċina yesterday. Photo: Chris Sant Fournier. Many of us have heard of Il-Maċina in Senglea but perhaps not everybody knows what it was used for. A clear picture will unfold about this part of the fortifications of the city and about the history of Senglea during a maritime festival to be held on Sunday along the Senglea Marina between 10 a.m. and 4 p.m.
Il-Maċina was used to mast and demast galleys during the reign of the Knights of St John and later vessels belonging to the British Royal Navy whose Mediterranean base was on the island. The masting and demasting as well as the taking on board and offloading of cargo and stores from ships was carried out by means of what are called sheerlegs, which were two wooden poles, later made of iron, used as a lifter. In order to recall the activities of yore, the local council has put in place a pair of replica sheerlegs. The sheerlegs were made at the dockyard and are about 32 metres long. Their operation is meant to recapture moments when Senglea was chock-a-block with maritime commerce. The contraption will be used in conjunction with a replica vessel made by Cassar Ship Repair Yard of Marsa who initially made it as a film prop. Cassar Ship Repair has also loaned out a full scale submarine which will be berthed close to Il-Maċina. 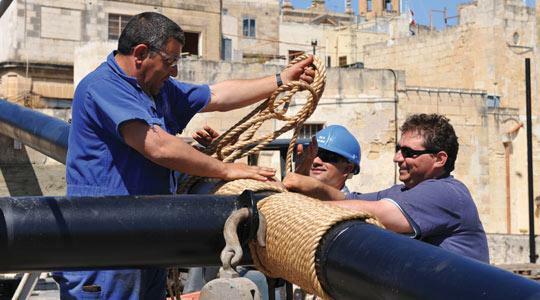 These events will help the public become more aware of the close connection between Senglea and the navies that made use of its army of master craftsmen during the past centuries, Joe Abela, keeper of models at the Maritime Museum in Vittoriosa and a member of the festival's executive committee, said. Adding to the nostalgic atmosphere of days gone by, a diorama of boat yard owners repairing boats will be one of the highlights. Fishermen from Mġarr, Qala and Marsaxlokk will be showcasing techniques and traditional tackle. One can either take the bus from Valletta or else take a boat trip from Valletta or Vittoriosa to Senglea. The parking lot next to the dockyard, on the approach to the tunnel at Għajn Dwieli, will be available with a shuttle service to the Senglea Marina. The items on the bill are too many and varied to mention. Suffice to say that they range from a photo exhibition of HMS Illustrious to folk singing, painting and church tours. A poignant event will be a procession with a statue of the child Madonna, recalling the one held on September 8 during the last years of WWII when the archpriest in Senglea was given the news that Italy had surrendered. The procession will be held at 11 a.m. and at noon. Another event will feature a speronara under sails, a vessel that was used to transport goods and passengers around the Mediterranean, Mr Abela added. The event is sponsored by funds passed to local councils by the Parliamentary Secretariat for Public Dialogue. See the programme on www.islalocalcouncil.com.